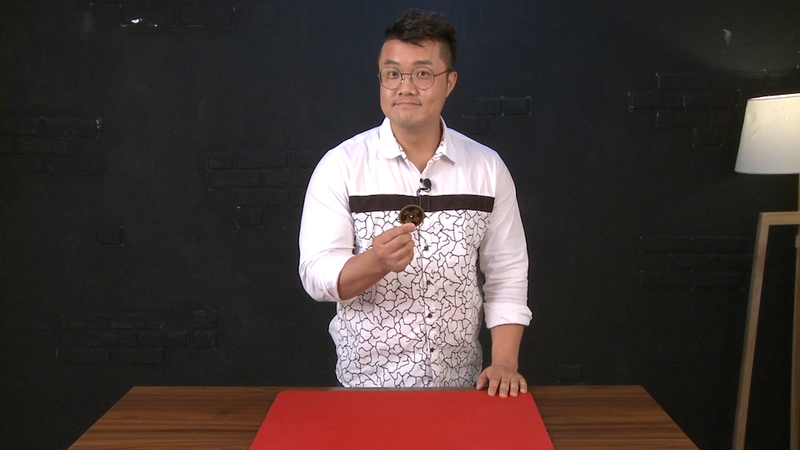 Spellbound: A one-dollar coin and a Chinese coin change places in just 5 simple moves. The Ring, The Coin, and The Coin Purse: First there's a ring in the coin purse, then instantly when reopened, a coin has taken its place. A simple yet elegant back and forth between a ring and a coin. 4 Coin Vanishing: 4 coins are held in the left hand. In just 4 moves, the coins disappear, and all 4 coins appear on top of your left arm. Standing Sponge Ball: Make a sponge ball disappear, appear and multiply. 3 Coins and a Purse Frame: A one-dollar coin appears out of a purse frame and disappears. Once the one-dollar coin disappears, a Chinese coin and then a penny appear one by one, then disappear again. For the finale, all 3 coins reappear out of an invisible coin purse! One Card and 8 Coins: One card and one hand are used to produce 4 coins on a table pad. The magician makes the 4 coins disappear with the same card and then makes 8 coins appear, using no gimmicks.